Ashraf Ghani Ahmadzai, the new president, will share power with his rival, Abdullah Abdullah, the new chief executive. KABUL, Afghanistan — Ending months of vote-related tension, Afghanistan’s election commission named a new president on Sunday only hours after the two leading candidates signed a power-sharing deal that names one of them as the country’s new chief executive. The commission named Ashraf Ghani Ahmadzai as the winner and next president and noted that Abdullah Abdullah will be the next chief executive. But it pointedly did not release final vote totals amid suggestions that doing so could inflame tensions. U.S. officials lauded the deal and said they believed Ghani Ahmadzai would sign a security agreement soon after taking his oath of office that would allow some 10,000 American forces to remain in Afghanistan next year. After 13 years of war following the Sept. 11, 2001 attacks, all combat troops are to withdraw by the end of 2014. Ghani Ahmadzai and Abdullah signed the national unity government deal as President Hamid Karzai – in power since the 2001 U.S.-led invasion ousted the Taliban – looked on. It took weeks of negotiations to form a power-sharing arrangement after accusations of fraud in the June runoff vote. A White House statement lauded the two leaders, saying the agreement helps bring closure to Afghanistan’s political crisis. 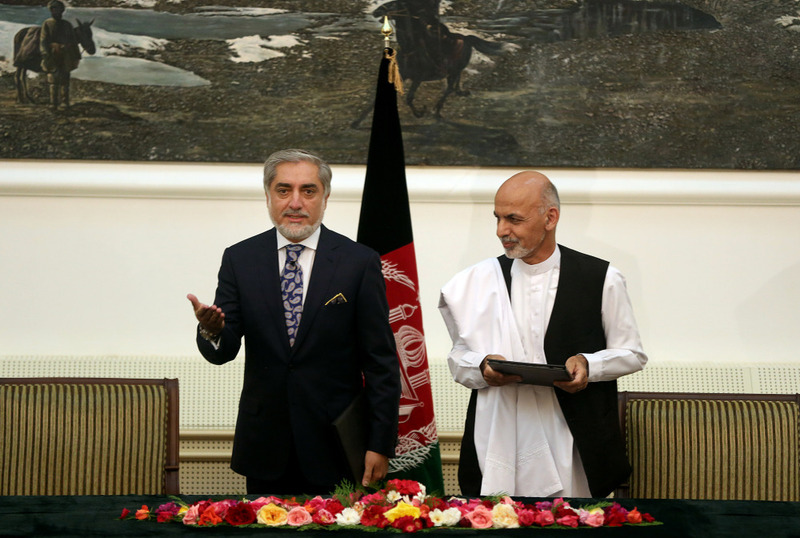 “This agreement marks an important opportunity for unity and increased stability in Afghanistan. We continue to call on all Afghans – including political, religious, and civil society leaders – to support this agreement and to come together in calling for cooperation and calm,” the White House statement said. A Ghani Ahmadzai supporter – Halim Fidai, a former governor – said Sunday that Kubish, the U.N. representative, told the commission not to release vote tallies. A U.N. official who insisted on anonymity because he wasn’t authorized to speak publicly said the allegation was not true and that the U.N. was only facilitating dialogue between the candidates and the election commission regarding the release of the results. A senior U.S. official said the vote result is transparent but may be released slowly over fears of violence. The official insisted on anonymity because he was not authorized to be identified publicly. The deal specifies that the president leads the Cabinet but that the chief executive manages the Cabinet’s implementation of government policies. The chief executive will also chair regular meetings of a council of ministers. An inauguration ceremony to see Ghani Ahmadzai replace Karzai as president and swear in Abdullah as chief executive was expected within days. Abdullah’s spokesman Fazel Sancharaki said the event could be held on Sept. 29. He also believes he won a June runoff with Ghani Ahmadzai. But initial results totals showed Ghani Ahmadzai with about 56 percent of the vote. After the recount the election commission invalidated 1 million of the approximately 8.1 million cast in the runoff, according to the unreleased vote counts, suggesting that fraud was indeed widespread. Though the White House statement said that “respect for the democratic process” is the only viable path forward for Afghanistan, the next Afghan government to many appears to be more of a product of negotiations than vote tallies.